This beautiful 3.0 x 4.8m Morston Summerhouse recently installed in Romford, Essex will benefit our customer as both traditional summerhouse AND a storage area. This summerhouse is particularly suitable for dual purpose use, due to the addition of a partition. This ensures the customer is able to create their ideal, relaxing summerhouse interior, by having the storage 'tucked away' cleverly by the partition. There are two entrances to this build allowing for the storage area to be separate from the summerhouse, and the ease of access from the garden means that retrieving garden tools such as lawn mowers can be done without having to go through the whole build. 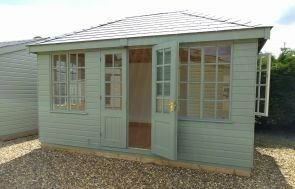 As with all of our garden buildings this model is fully customisable to your exact requirements and benefits from free delivery and installation by our expert team, as part of our end to end service. 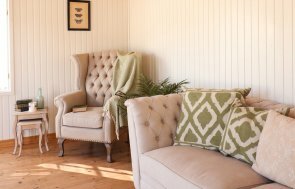 The Morston is a chalet style summerhouse, much like the Blakeney, but with the addition of a 1.2m deep veranda to relax on. Alternatively, if you’re in the area why not visit us at one of our 6 national show centres, to experience the luxury service we provide first-hand. We have over 25 different size and style garden buildings on display for you to view at your leisure. 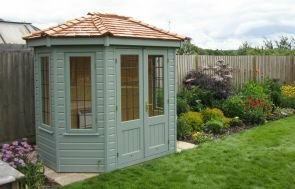 If you like the idea of having your own garden building, take a look at the comprehensive range of summerhouses by clicking on the link below.